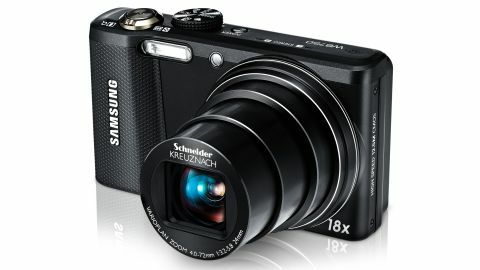 The Samsung WB750 is a pocket-friendly superzoom that sits in the Korean manufacturer's Performance range of compact cameras. It's not the flagship model in the range - that honour goes to the Samsung WB850F with built-in Wi-Fi and GPS - but the WB750 does offer a range of high-end features at a price that will give it wide appeal. Like many of 2012's big zoom compacts, the WB750 shares many features with the outgoing model it replaces. As with last year's Samsung WB700, the WB750's Schneider lens with 18x optical zoom offers a 35mm equivalent reach of 24-432mm. This versatile, broad span makes it a good choice for travel photography, enabling you to shoot everything from wide landscapes to wild animal portraits. The Samsung WB750 also continues to offer Program, Aperture Priority, Shutter Priority and Manual exposure modes, as well as a range of specific scene modes, Smart Auto and Dual IS (which combines optical image stabilisation with the ISO-increasing digital type). Where the two cameras differ considerably is in the choice of image sensor. The WB700's sensor was based around CCD technology, offering a resolution of around 14.2 effective megapixels. The Samsung WB750 introduces a new BSI (Back Side Illuminated) CMOS sensor to Samsung's compact camera range - albeit one that offers an effective resolution of 'only' 12.5MP. The sensitivity range runs from ISO 100 to ISO 3200. Although in terms of headline figures this might seem to be a step backwards from the WB700, it actually represents a considerable leap forwards in terms of potential performance - particularly in terms of low light photography and noise reduction. Further developments on the Samsung WB750's specs sheet include Full HD 1080p video (compared to 720p on the WB700), 3D, HDR and panorama functions and a 3-inch screen that's more than double the resolution. Armed with a responsive autofocus system and capable of shooting at a rapid 10fps for up to eight photos, the Samsung WB750 can help you get shots in situations where other big zoom compact cameras would struggle. In fact, in Pre-capture drive mode, the camera can record eight photos between the moment the shutter is pressed halfway to the point when it's fully depressed, helping to reduce the chances of 'missing the moment'. Even shooting HD video footage doesn't stop you taking pictures - 10MP JPEGs can be captured while recording 1080p movies. With a recommended retail priced of £260 in the UK and $280 in the US, the Samsung WB750 is in the same sort of price bracket as the Canon IXUS 240 HS, Panasonic Lumix DMC-FX80 and Ricoh CX6, and is cheaper than more expensive superzooms such as the Panasonic TZ30.